Schulz's love of Classical music developed after World War II when he went to work with a spirited group of artists at Art Instruction Schools in Minneapolis, Minnesota. He and his colleagues held lively discussions about literature, films, and Classical music. Schulz recalled that "We all collected classical albums, which we frequently shared on evenings when we got together to listen to music and challenge each other in wild games of hearts (a card game)." Over the decades Schulz went on to embed Classical music into hundreds of strips. In 1997 the Classical music world returned the favor. Pulitzer Prize winning composer Ellen Taaffe Zwilich, commissioned to write a family concert by the Carnegie Hall Corporation, chose to compose the Peanuts Gallery for Piano and Orchestra, which premiered in New York City. 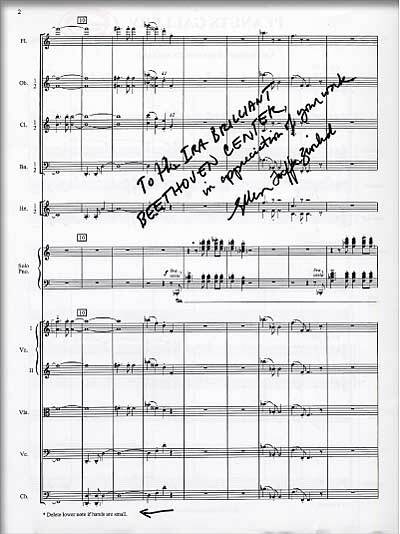 The fifth movement is titled "Schroeder's Beethoven Fantasy." The first movement quotes the beginning of the Hammerklavier. Readers rarely question Schroeder's obsession with Beethoven, as they became accustomed over nearly 50 years to his great love of the composer. However, whenever the cartoonist was asked why Schroeder was so enamored of Beethoven, he always gave a matter of fact explanation: "The answer is simply that it is funnier that way. There are certain words and certain names that work better than others. I don't believe it would be half as funny if Schroeder admired Brahms." Indeed, the name Beethoven, pronounced "Bay-toe-ven" in German, is funnier than the monosyllabic "Brahms." Schulz's choice, however, was fortuitous, since Beethoven's biography provided Schulz with many opportunities for exploring Schroeder's great passion for the composer.